The cold weather is here, but our deals are heating up! Upgrade to Unstoppable with a Trane furnace system that is tested to run through anything! 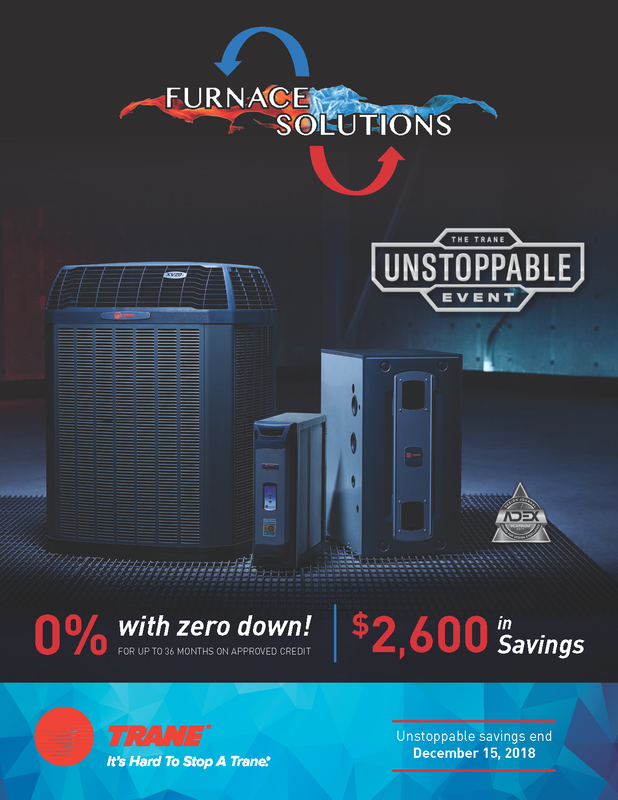 Connect with us for a FREE in-home consultation to find out how you can bring home an Unstoppable Trane furnace at 0% APR for up to 36 months or save up to $2,600! * See your participating independent Trane Dealer or visit Trane.com for complete program eligibility, dates, details and restrictions. Available through participating independent Trane Dealers. Special financing offers and discounts from $100 up to $2,600. All sales must be to homeowners in Canada. Void where prohibited. Valid on qualifying systems only. Offer expires 15/12/2018. 36 months No Interest, Equal Payment Plan Subject to credit approval. A minimum purchase of $1000 including taxes. A $39.95 Administration fee will be debited from your account after installation. An equal monthly installment will be debited from your bank account each month through-out the promotional interest-free period and payment in full for this installment must be made prior to or on each monthly due date. If payment is not made by the due date, you shall without notice pay interest at a rate of 2% per month, calculated and compounded monthly not in advance on: (A) any past due Monthly Payments and (B) and any other amounts due to us which are not paid on their due dates including the total balance due. (See the terms and conditions on your Equal Payment Agreement for details). Financing provided by SNAP Home Finance. Offers available at participating Dealers only. Ask for details. Offer expires 15/12/2018. **See your independent Trane Dealer for complete program eligibility, dates, details and restrictions. Special financing offers OR discounts up to $2,600 valid on qualifying equipment only. Offers vary by equipment. All sales must be to homeowners in Canada. Void where prohibited.